The Cambodian Market runs along Ho Thi Ky Street in Ward 1, District 10, Ho Chi Minh City, offering peculiar Cambodian foods from the early morning till midnight. Street food lovers should find this market a real attraction as the small-sized food stalls boast such Cambodian delicacies as goi du du (papaya salad with sour sauce), bun ca (fish rice vermicelli), hu tieu (pork noodle) or che (sweet soup). One special dish to mention is ca loc (snakehead fish) from the food stall of Ba Ut Mien. “We do raise these ca loc in captivity, but we feed them with live fish, so the meat is just superb,” she said. In Vietnam, wild animals are believed to boast better meat quality than farmed ones. In other words, the meat from chickens, pigs, or fish living in the wild can put to shame that from battery farming. To explain the quality of her fish stock, she emphasized that even wild fish are not always the best, especially the snakehead fish whose meat turns tough and loses taste around April and May. “Fish kept in captivity here are even better as they actually came from Tonle Sap,” she added. Tonle Sap, literally ‘the great lake,’ is a huge freshwater lake circled by five provinces in Cambodia. Ba Ut Mien was Cambodian by nature, but her family had resettled in the Mekong Delta of Vietnam by 1970, only to move back home five years later. The Khmer Rouge dictatorship in Cambodia around 1979 was so harsh that her family had to flee their homeland. This time they came to Ho Chi Minh City, together with many of their Cambodian fellows. Another specialty originating in Cambodia to mention is hu tieu, or pork noodle soup. To the Saigonese, the term Nam Vang was the Vietnamese way of saying Phnom Penh in the past, and hu tieu Nam Vang (or Phnom Penh Pork Noodle Soup) is quite a popular dish. A 60-year-old woman selling it in this market claims that her version of hu tieu Nam Vang is 100 percent Phnom Penh style. Her name is Giau, which translates to richness, and she named her restaurant Phu Qui, or wealth. “My name’s Giau, but I’m not rich at all although I’ve been selling hu tieu for 40 years!” she joked. For sweet teeth, the sweet soup sold right in the middle of the market should be much loved. The 70-year-old owner of the place, Huynh Thi Huoi, came to Ho Chi Minh City with her family in the 1970s. Her place stands out with truly Khmer varieties like che thot not (jaggery sweet soup), che hot me (tamarind seed sweet soup), che bi do chung (pumpkin sweet soup), che trung (egg sweet soup), and che thap cam (all-together sweet soup). In the past, she used to sell only single-taste sweet soup, but during the years in Vietnam she witnessed how the locals added all kinds of toppings to their servings. “That idea is as appetizing as it is esthetic,” she commented. Therefore she decided to modify her sweet soup to accommodate the Vietnamese way of eating. “Cambodian sweet soup tailored in the Vietnamese style clearly sells like hot cakes,” she rejoiced. One popular place that everybody around the Cambodian Market would recommend is that of Ba Tu Xe, a 45-year-old Phnom Penh native. It is located right in the corner in front of the Le Hong Phong shrine. The first impression eaters should fall under upon coming here should be the artistic arrangement and the use of different object shapes for decoration. Even the choice of colors is stimulating to the taste buds: hot colors dominate the place. When your correspondent dropped by, Ba Tu Xe was giving advice to a Vietnamese expat from the U.S. on buying ready-made seasoned snakehead fish. “You should buy it only 2-3 days before departure. That’s better as we don’t use preservatives,” she explained. Her source of fish came from her Cambodia-based relatives doing business in food seasoning and seafood from the lake. Num bo hoc is a much sought after noodle dish at her place. It can sell out in just 3-4 hours in the morning. What sets her version off from others is the original Cambodian taste unaltered in any way. It is served with steamed string beans, snakehead fish fillets, and covered in a kind of dark yellow sauce. The broth is inserted after that. The herbs that accompany this specialty include raw string beans, water lily, sliced morning glory, raw sprouts and cucumber slices. The soul of Nam bo hoc, according to Ba Tu Xe, is the particular fish from Tonle Sap and the core seasoning like turmeric or lemongrass. One impressive thing to mention about Ba Tu Xe is the attachment she has to the family business, which was passed down to her from her mother. Since her food products are of premium quality, numerous businessmen attempted to contact her for franchise opportunities. “I don’t want any other branches, as people may mess up with the ingredients and damage our family’s image,” she said. An owner of a big restaurant in downtown Ho Chi Minh City once earnestly offered to buy her recipe at a really high price. Despite his many attempts, she still said no. She also rejected his thousand-dollar job offer as head chef. “I have to keep this recipe for my son, so that he can make a living for himself when he’s grown up!” she explained. 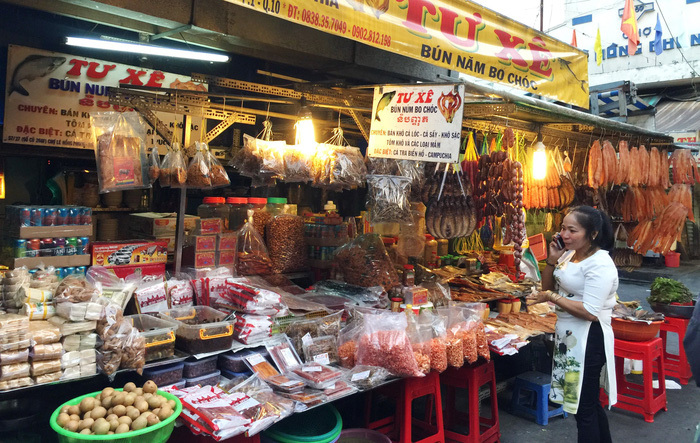 Nguyen Thi Lam Tuyen, vice chairman of the People’s Committee of Ward 1, District 10, Ho Chi Minh City, said that the authorities are considering a proposal to turn this place into a night market. They expect the Cambodian Market to become a tourist destination in the city. According to Tuyen, more than half of the 14,000 residents in Ward 1 are from Cambodia. “The Cambodian community here lives in harmony with the Vietnamese. They abide by business registration regulations and hygiene standards,” she added.